Daisy Daydreams is rated 5.0 out of 5 by 2. Rated 5 out of 5 by Rl12970 from Daisy Daydreams This purchase was so convenient, fast and very worth buying! I would love to continue sharing them with my friends and family close and far! Rated 5 out of 5 by Janeferguson60 from Great experience! Very impressed after using this service for the first time. The flowers were delivered just three hours after ordering! And they looked exactly like the photo! Very happy- will use them again. 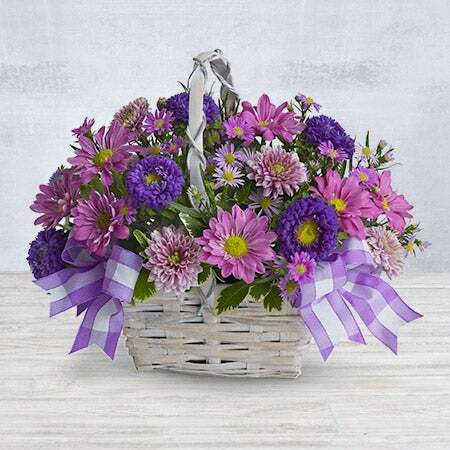 A gorgeous presentation of lavender daisy spray chrysanthemums, dark purple Matsumoto asters, lavender cushion spray chrysanthemums and purple Monte Cassino asters accented with fresh greenery in a white bamboo basket completed with a lavender and white striped ribbon. A perfect gift to lift anyone's spirits!